Undergraduate and Graduate students, enrolled at either a Canadian University/College Engineering, College Technology or OHS program and wishing to enter the 2019 Minerva Safe Design contest, will need to advise Minerva Canada with an email at minerva@safetymanagementeducation.com by February 8, 2019. Final submission date for student projects and a signed entry form is April 12, 2019. An Entry Form and details on the 2019 competition are shown below. 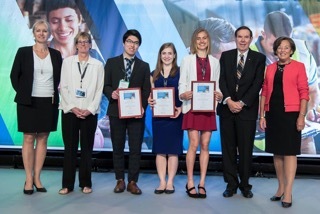 Engineering students from the University of Guelph and University of Alberta were awarded first prize of $3,500 and second prize of $1,500 respectively at the WSPS Partners in Prevention Conference on May 2, 2018. See 2018 Minerva press release for details and other press releases for past winners. 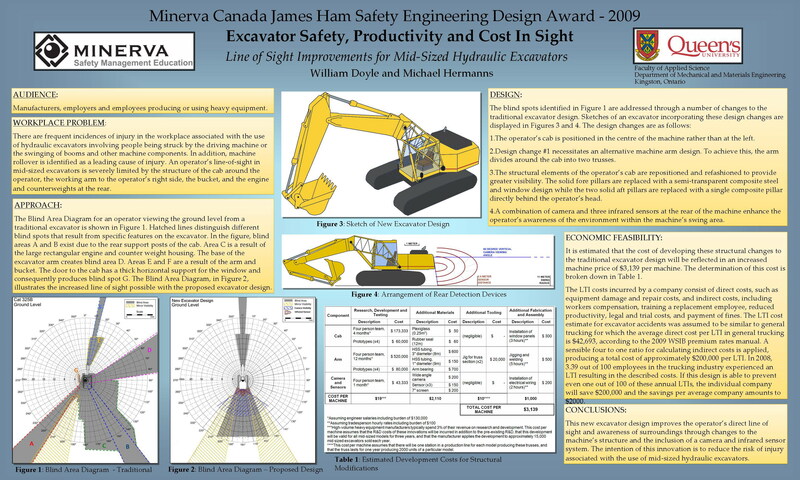 In 2006, Minerva Canada, with funding from the Ontario Workplace Safety and Insurance Board (WSIB), developed a program to recognize individual engineering students or teams of such students who have developed an innovative health and safety solution. The competition was first open to Ontario students and, in 2010, was extended to all engineering undergraduate students from Canadian universities and colleges with accredited engineering programs. The awards go to students who make an original and unique contribution to integrating safety into engineering design. Winners receive a first prize award of $3,500 and a second prize award of $1,500 and media exposure for the student(s) and their respective university or college. Through these awards, Minerva Canada and the WSIB honour James Ham, whose Royal Commission Report on Health and Safety led to the creation of Ontario’s Occupational Health and Safety Act and to the adoption of the Internal Responsibility System in Ontario workplaces. Encourage students and engineering faculty members to integrate safety into all designs. Produce safer designs of devices, processes and systems. Raise student awareness of Process Safety Management (PSM) and Safety, Health and Environment (SHE) management concepts. Business and industry are constantly looking for ways in which new technology or innovative practices can improve efficiency and for ways they can respond more rapidly to changing demands. Unfortunately, the combination of these two – innovation and change – often conspires in unexpected ways. One of these regrettable outcomes is the inadvertent introduction of new hazards into the workplace and the elevation of risks to workers. Suggesting ways to improve the existing design of devices, processes or systems. Envisioning new, innovative designs that will eliminate or reduce potential hazards. Creating tools to help manufacturers and workplaces integrate safety into new or retrofitted designs. It is hoped that this elevated awareness will lead to better integration of health and safety management programs in Canada’s post secondary schools and, in the long term, reduce workplace illnesses and injuries.